In their original service lives, from 1948 to around 1980, Muni’s biggest PCC streetcars were called “torpedoes,” because of their shape. Now, restoration is about to begin on four more of these double-end cars, which will retain their original Muni numbers of 1006, 1008, 1009, and 1011. Three other cars of this class, Nos. 1007, 1010, and 1015, are already in service on the F-line. Muni Car No. 1006 in 1951 at Chestnut and Fillmore, in its original green and cream “Wings” livery, during a fantrip on the old F-Stockton line. Fred Mathews Photo. As a celebration of this most successful streetcar type in American history, Muni has painted its PCCs in the paint schemes, or “liveries,” of cities that once ran PCCs. But double-end PCCs were rare. The only systems that ran them were Muni, Philadelphia’s Red Arrow Line, Illinois Terminal Railroad serving suburban St. Louis, Southern California’s Pacific Electric (which ran double-end cars with front and center doors, much different looking than Muni’s), Dallas, and Boston (which bought Dallas’ cars second-hand). Muni has already decided that the first double-end true PCC delivered to it in 1948, No. 1006, will be restored to its original green and cream “Wings” paint scheme (shown above). That leaves three “torpedoes” for which liveries have not yet been finalized. We want to emphasize that the final decision on these belongs to Muni, which of course owns the streetcars, and could decide to paint all four torpedoes in its “Wings” scheme or in some other Muni livery. But Muni has stuck to the multi-livery approach so far, and has asked Market Street Railway as its non-profit preservation partner for our thoughts on liveries for the torpedoes. We, in turn, want to open it up to get our blog readers’ feedback as well. We want to do this in a series of posts, taking one livery possibility at a time, starting with Dallas. The Texas town ran PCCs from 1945 to 1956. Dallas Railway & Terminal Company’s 25 double-enders were built by Pullman-Standard and had narrower rear doors and a narrower body than Muni’s torpedoes, built by St. Louis Car Company. Of historical interest, when Dallas retired its PCCs, they tried to sell them to other streetcar operators, with New Orleans Public Service apparently giving them serious consideration for its Canal and St. Charles lines, but ultimately rejecting them because the narrow rear doors would be a hindrance for passengers, who then boarded at the rear in New Orleans. Original 1945 Dallas Railway & Terminal Company livery, predominantly red. 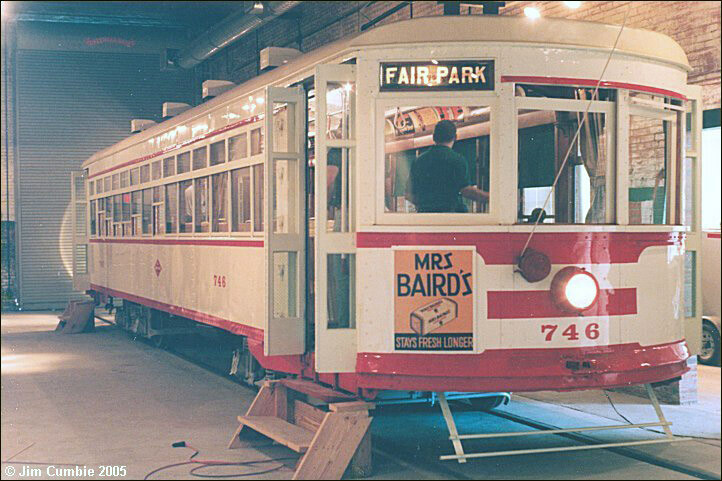 Dallas also approached Muni to buy the cars, but Muni had no money for purchases at the time (but ended up leasing 70 used streetcars from St. Louis public service in 1957 to get around this). After also striking out with Mexico City, Seoul, and Toronto, Dallas finally sold its PCCs to Boston in 1958-59. Dallas’ PCCs arrived from the factory in a predominantly red livery with cream and silver trim. As that city’s first (and last) modern streetcars, they were dubbed “gliding beauties.” According to the book PCC Coast to Coast, Dallas Railway & Terminal picked the colors but didn’t tell the builder how to apply them, so Pullman-Standar used the diagrams for its earlier Pacific Electric PCCs as a guide. Second Dallas livery, predominantly cream. The original livery lasted a little less than half the life of the cars’ tenure in Dallas, replaced by a mostly cream livery with red trim, featuring three bars across the ends instead of the wings motif of the earlier scheme. We don’t know of an obvious reason this happened. Anyone know? So the question in this post: should one of the restored torpedoes be repainted in a Dallas livery, and if so, which do you prefer – red or cream – and why? You can leave your comment below, or if you prefer to comment privately, email comments@streetcar.org. Having a PCC painted to honor Dallas would be great, the variety is the best thing about the F line. I definitely prefer the original Dallas scheme with more red, the mostly cream colored second one seems a bit bland (Especially on the sides) to me. I also think the second one also looks a bit too similar to the paint scheme 1079 already has. The “PE inspired” paint job gets my vote (for obvious reasons to those who know my Southern California background). I think a few of the Dallas cars that went to Boston survive (they were dubbed “Texas Rangers” by New England railfans), but their bodies have extensive road-salt damage, and Muni has enough streetcars to rebuild without taking on that challenge. I agree with Chuck, I would also like either 1009 or 1011 retain their simplified livery scheme, as both were painted simplified. I’d like to see another car in Pacific Electric paint, honoring the Daylight Southern Pacific inspiration. I’d love to see a Dallas car. While I am partial to bright colors like red, either color scheme would be a good representation. Another city I’d like to see some consideration given to is Vancouver, BC. They received an order of PCC cars during WWII and even beat out Montreal for the limited number of orders available during the war. Vancouver continued to operate PCC cars and other streetcars until trolley buses took over starting in 1948. @Chuck, Toast, and Paul, as stated in the post, this is one of a series, and we’d like to keep comments focused on the Dallas liveries, up or down, red or cream. In subsequent posts, we will focus on other options, including additional San Francisco liveries, as well as other cities. I’m glad to hear there will be a Texas streetcar on the F-line and I hope you go with red. The cream just looks dull and ordinary. Soon after SEPTA takeover of the Red Arrow Lines, a St. Louis and a Brill double-ender showed up in a very attractive gold/white with black roof and red trim. Even though this livery was very short lived, (the St. Louis car even had tinted windows) it was very well suited to the lines of this eqipment. First of all: Thanks for the photo at the top of this page. I grew up, on Chestnet St., three blocks east of this photo. I went to Marina Jr. High, right across the street, from this photo. In the time I lived there, 1948 to when the tracks were removed, I never saw a PCC, or a double-ended Torpedo, on Chestnut Street. Thanks for bring back great memories. Now, to the subject of Dallas: I like the predominantly Cream livery. The Red livery is too Red, in my opinion. If a car were to be painted in a Dallas scheme, I’d prefer the red. I prefer the original livery for the Dallas car. I like the red one better. The cream one looks too much like 1079. I think that all future rebuilds of origionally-owned Muni PCC cars should be painted in the Green/Ivory colors that they wore when delivered. There are enough systems already represented in the historic PCC fleet. I feel that there should be more cars showing San Francisco’s colors – after all, they will be running on THIS City’s streets. And many of the City’s own residents will remember and enjoy seeing them again. This would also be another celebration of the City and would also tie in with Muni’s upcoming 100 year anniversary. I like the Cream,for 1011,it’s obvious,Dallas didn’t like the Red one…..thanks. Much as I like the Dallas PE-inspired paint job, Don Jewell has a point. My first encounters with Muni were back when “green machines” ruled Market St.: PCC’s, Mack diesel buses, and trolley coaches. If the “Torpedoes” are all assigned to the “E” line, and all have 1960’s color schemes, it would be a “blast from the past”, even though it’s a route that didn’t exist in the heyday of the PCC. And we also have 162 in the green scheme. Speaking of “green”: When the opportunity presents itself, I mention that Muni runs on hydro-electric power, even the big motors that power the cable car system. My vote is for Don Jewell’s opinion. PAINT THE TORPEDOES IN MUNI COLORS, PLEASE!!! We have enough other cities represented as it is. I think a Dallas painted car would be great. Unfortunately, both paint schemes are very similar to existing cars. The cream is very similar to 1079 (Detroit) and the red is very similar to 1074 (Toronto). If I have to pick between the two, it would be for the red, as long as it is a different shade of red than 1074. If that is not possible, maybe we have to skip Dallas, although that would be a shame since they were one of the few cities that had double end PCC’s, which is the kind of car we are discussing. For that reason alone, Dallas should receive extra consideration. @Don Jewell and others who have submitted comments on keeping the PCCs in Muni liveries, we are going to create a separate post to consider the various San Francisco liveries these cars could wear, including the concept of Muni Wings on all four cars. We’re doing it this way to encourage input and interest from a new generation of streetcar supporters, who don’t know all the various systems that ran PCCs but who want to learn more, as well as from people who have been following streetcars for decades. We’ll be posting every few days on this, covering all the possible alternatives, so we hope people will stick to the topic at hand and be patient until the alternative they feel most passionate about is up for discussion. We’ll have a wrap up post as well where people will be free to make a final case for their favorite livery set. Thanks. If one is painted in the Dallas livery it should be painted in the cream with red trim to absorb less sunlight. It was one of the lessons Dallas learned in their climate. As for painting one in a Dallas livery, go ahead and flip a coin. I don’t have any reason to like or dislike the place. Given how popular the collection of different cities’ paint schemes is, I strongly support having a “Dallas” car. Given a choice, I’d go with the red one. Here’s a link to a video showing Dallas streetcars and trackless in the cream color. Looks tropical. Maybe I’ll change my mind about preferring the red. (I don’t see my original post, so I hope I’m not duplicating): I’d go with the red Dallas over the white and red as that is too close to our Detroit representative, which is already tops my least favorite livery list. I’ll hold out to see what other liveries are presented before I truly commit to Dallas as neither livery is all that exciting. I have to go with the second livery. As a retired motorman, I find that the alternating red and cream stripes on the ends to be a plus as a safety feature. It will say to motorists following the car, “Don’t Mess With Texas”. What I mean to say, by that remark, is that this paint scheme should prevent motorists from rear-ending the car. Yes, the colors on the later scheme are similar to Detroit 1079, but the end treatment of the alternating stripes are what make the livery great and distinguishing. Besides, I think more Dallas residents remember the second scheme moer readily, as it was also applied to their older 700-series trams, which also lasted to the end of service. Whatever the choice, I think everyone here would be just as honored. The predominantly red livery is my choice – very unique looking, and its history would make a great story to include inside the restored car. The cream one looks like a mix of Detroit and Montreal, and there are already enough cream colored cars in the fleet anyway. I personaly like the Dallas red scheme. The creme is to bland for my tastes. The red realy emphasizes the beautiful lines of the torpedo. Having just discovered your blog, what a great discussion to have. Glad to see Andy Nold involved as he’s is really a good source to go to for information. My wife and I love our trips to San Francisco to see the Market Street line. My wife enjoys our trips on the streetcars, too. I think the second scheme evolved because of weather and ease of application, but that’s strictly my opinion. Seashore has a Dallas PCC and the Southwest Railroad Historical Society had one at Fair Park in Dallas but I believe it was beyond hope for restoration and didn’t survive. I hope I’m wrong.